Your Content Is An Asset – Where Have You Left It? Uploading your content to social media is an act of publishing; it’s not an asset management strategy. As we know, everyone is creating and posting content to websites and social media channels and they do so on the assumption that posting in on Vimeo, YouTube, Insta, Facebook, SnapChat, twitter etc., is a safe depository for our content. But they’re not. Lego has a library of every piece and pack of product ever made over the company’s 6o year history and media companies used to keep extensive tape libraries. Now content is a new product category for every business and over time, most businesses will amass a considerable volume of content they have created, commissioned and sourced, which has a value in terms of investment and as an historical record. If we were to think of each piece of content we create, commission, source or use as a page of a book we’re writing and paying to own, we wouldn’t leave those pages scattered to the wind. We would bind them and store them safely because they have a value. Cumulatively we would have what is known as a digital asset library. When, not if you’re asked by the finance people ‘where have we stored the content files we’ve made and purchased’, “on YouTube, Instagram or Facebook” is not gonna cut it because these files are an asset. They hold copyright material, unique imagery, captured historical moments and significant elements of brand equity, not the least of which is the imprint they have created in the public realm. There’s even value in the ‘cutting room floor’ footage that never makes it to the polished published version, should you want to use it in the future for a ‘making of’ or other historical storytelling. That’s why we use an Australian based independent digital asset management platform to host, serve and archive the content we create. For as little as $19 per month our clients have a central depository for their content that will store, serve and archive their digital storytelling and history. 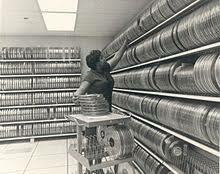 We believe it’s important to have a central library and archive of the content so its protected and secured. Publishing content to a free or ad supported public access channel does not serve the content owners business in this regard. Also ith so called ‘free’ publishing channels the distribution and monetisation of the content asset is skewed in favour of the channel, not the content owner, whereas our solution empowers the content owner to deliver content in a professional, efficient way with total control and flexibility over monetisation and distribution. If you would like to know more about why you should use an independent digital asset management service or would like a recommendation on which one to use, I’m happy to give more information.